Abrasion Resistant Steel Plates, Abrex 400 /450 /500 /600 Plates & Sheets, Manufacturer, Supplier, Stockiest, Mumbai, India. Abrasion Resistant Plates & Sheets/AR (Abrasion Resistant) Steel Plates and Sheets are utilized to create of various items, for example, transports, chutes and liners and total holders. Our solid relationship with dependable merchants empowers us to offer these plates as indicated by determinations set around our profitable customers. These Abrasion Resistant Plates and Sheets are broadly requested by customers inferable from its high quality, sturdy execution and rough development Apart from this, these Abrasion Resistant Plates and Sheets show a phenomenal mix of high imperviousness to effect, workability, weld capacity and imperviousness to scraped area. Rexton Steel & Alloys supply top notch Abrasion Resistant Plates and Sheets with predominant wear execution. Joined with astounding weldability these Abrasion Resistant Plates and Sheets stand up well in the hardest businesses such mining and earth moving. 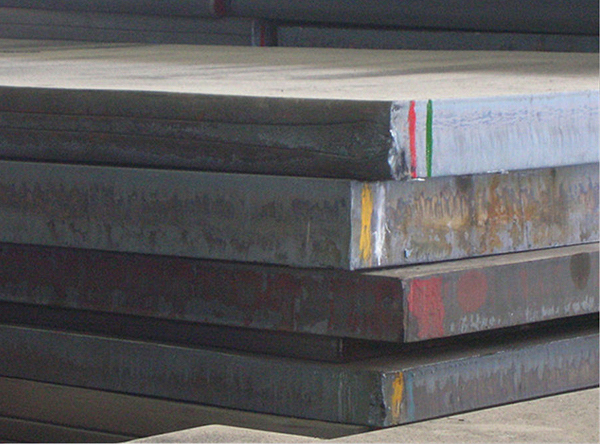 Otherwise called scraped spot safe steel plate, the high safe long life Abrasion Resistant Plates and Sheets can be sliced and profiled to your precise prerequisites and give an amazing quantifiable profit where long existence of the steel is at a premium. With various levels and thicknesses on offer, we can supply the right kind of plate for the right employment, whether it is for development hardware or mining gear. Abrex 400 Plates and Sheets is a through solidified scraped spot safe steel with a regular hardness of 415 BHN. Abrex 400 Plates and Sheets are the most generally utilized of the wear safe evaluations. Abrex 400 Plates and Sheets show an incredible blend of high imperviousness to effect, workability, weld capacity and imperviousness to scraped area. Abrex 400 Plates and Sheets has around 3 times the scraped spot resistance of regular steel plate and adds to dragging out the administration life of mechanical parts. The Abrex 400 and Abrex 500 series(Previously named as Sumihard 400 and 500). The utilization of scraped spot safe ABREX steel plate extraordinarily lessens the heaviness of basic individuals presented to serious rough conditions. Contrasted and customary steel, ABREX steel plate diminishes basic weight and conveys monetary benefits. Appropriation of superior scraped area safe ABREX will drag out the administration life of hardware and segments. Steel in contact with water containing H2S will consume creating hydrogen at its surface. H2S not just represses the arrangement of hydrogen gas, so diminishing the open door for it to get away, however elevates its ingestion into the steel. Rockstar 400 is a wear safe extinguished and tempered steel plate grade having a magnificent mix of hardness, formability, weldability and durability to meet manufacture necessities. It has outlined with generally low carbon identical for better weldability. Rockstar 400 is a savvy scraped spot safe material utilized for creation of crushers, liners for truck beds, containers, containers, chutes, excavators and transport troughs, solid blender drums, garbage truck bottoms, basin lips, road sweepers and dump trailers and some more. Rockstar 500 is a wear safe extinguished and tempered steel plate having a fabulous mix of hardness, formability and weldability to meet manufacture requirements. Rockstar 500 is utilized for application where the parts are subjected to wear. It is a prominent abrasion-resistant item to mine and other profoundly grating modern applications. We are having biggest stock and prepared stock for Rockstar 500 Abrasion Resistant Steel Plates in various size, grades and cuts.